Century Cruises has launched its second new 398-guest vessel, the Century Legend, on the Yangtze River in China. Its identical sister ship, the Century Paragon, began operating in March. Century now has a fleet of seven vessels. 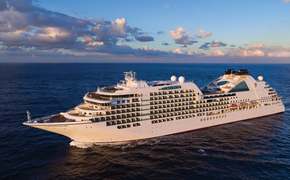 Designed for the Western traveler, Century’s ships were designed by European naval architects Yran and Storbratten, the well-known architects for many other cruise lines, including Disney, Seabourn, Holland America and Viking River Cruises. The Century Legend will depart on Saturdays on three-night downstream itineraries from Chongqing to Yichang and on Tuesdays for four-night upstream itineraries. The itineraries visit Shibao Pagoda, the Three Gorges of Daning River or Shennong Stream, and the Three Gorges Dam. The ships also transit the dam’s locks system. The Century Legend has exterior scenic elevators, a seven-story atrium lobby, and a 2,000-square-foot indoor swimming pool and leisure area. The ship also features a pillar-less multi-function room with 12-foot ceilings that hosts evening performances and guest lectures. It also can be used for meetings, conferences and special events. The ship also has a 150-seat HD cinema with multi-lingual capabilities, and wireless Internet throughout the ship. All 196 staterooms feature a private balcony. There are two 1,140-square-foot Presidential Suites, 34 Executive Suites (415 square feet) on two Executive Club decks, four Junior Suites (323 square feet) and 156 Riverview Staterooms (301 square feet). Executive Club and Presidential Suite guests can use the Executive Club á la carte restaurant, bar and reception area. All suites and staterooms feature daily maid and turndown service, superior king-sized bedding, all-cotton luxury linens, a separate sitting area, LCD satellite televisions (with channels including HBO and CNN), individually controlled air conditioning, and a bath with separate tub and shower. Suites also feature butler service, Italian coffee makers, a minibar, DVD players, daily snacks and fruit.